Regional Science Policy & Practice (RSPP) is the official policy and practitioner orientated journal of the Regional Science Association International. It is an international journal that publishes high quality papers in applied regional science that explore policy and practice issues in regional and local development. Regional Science Policy & Practice is published by Wiley-Blackwell on behalf of the RSAI. Members have free online access to the journal. Who may access to RSAI publications? You must be an RSAI member. Membership of RSAI is obtained through membership of a local Section. 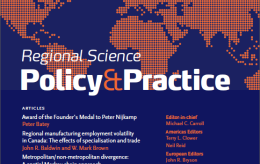 Regional Science Policy & Practice is the official policy and practitioner orientated journal of the Regional Science Association International. 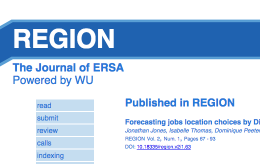 RSPP is published by Wiley-Blackwell on behalf of the RSAI. Please follow the link to learn more on RSPP.